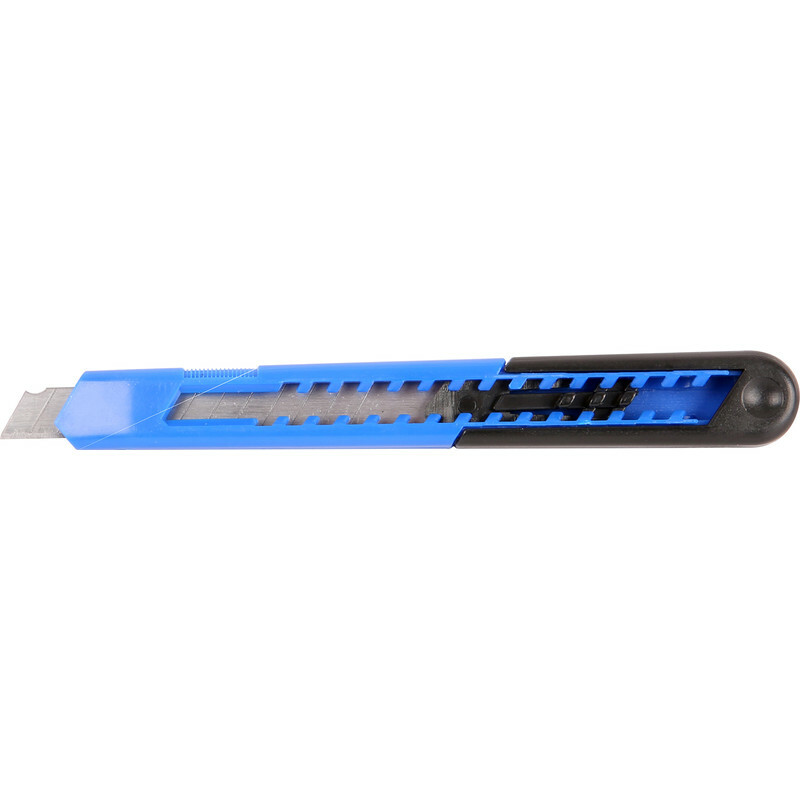 Excellent value snap-off blade knife. Spare blades 9mm 15466 or 18mm 85842 . Snap Off Blade Knife 9mm is rated 4.6 out of 5 by 14. Rated 4 out of 5 by momo from Great price I bought a couple of these. Ideal when decorating and good price. Rated 4 out of 5 by Old dog new tricks from Effective little knife. My all purpose knife has gone missing on site, so I bought this to use until I find the culprit. Its a good, effective knife, not super strong, but does the job at a low cost. Ideal for light work. Rated 5 out of 5 by Rooster30 from Snap off blade craft knife I purchased a pricey craft knife a few weeks ago from a well known auction site well after a while it fell to pieces. These are as cheap as chips and much better quality and sturdier too. Rated 5 out of 5 by LORRETTA from Snap Off Blade Knife 9mm Perfect size for an assortment of jobs, I use it for when making cards, retractable locking blade makes it a very safe item to use, and the snap of blades makes it kind on the pocket. Buying from Toolstation is a bonus as they are dispatched quickly. Any time I have had contact with the company they have been more than happy to help with a good knowledge of the products.